Description: Nifty arrangement of structures surround a group of engines including former Conrail geep 38-2 waiting near the fuel pad at Oak Island engine facility under sunny skies. Description: 8:30 AM at Metuchen. Description: Shut down for the weekend. Description: Two aging GP38-2 units built for Penn Central still at work. Description: NS local heading south toward Perth Amboy. Description: NS GP38-2s 5290 and 5291 break down a train as the sun sets for the day. Description: NS 5290 & 5291 Just passed the points. Description: Going to pick up the empties. Description: NS 5290 & 5291 running around the loaded tank cars it just cut loose from. Description: NS5291 is on the point of the ballast train. Description: The train is coming up Linden Ave. W and is just about to cross the road that leads into Tropicana. Description: NS 8311 is the first of 5 engines on 19G heading west on a clear afternoon through CP Belt. Description: Dead in Tow units trailing on 19G. Description: NS GP38-2 5291, still wearing its Conrail paint scheme. 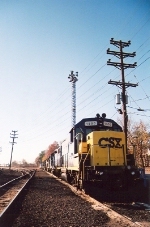 Description: Consecutively numbered GP38-2's at Paulsboro yard. Description: This GP38-2 built for the Penn Central and now owned by Norfolk Southern assigned to Conrail Shared Assets Operations still proudly displays it's Conrail logo. Description: Conrail Shared Assets power at Paulsboro. Description: Sorry about the signal.